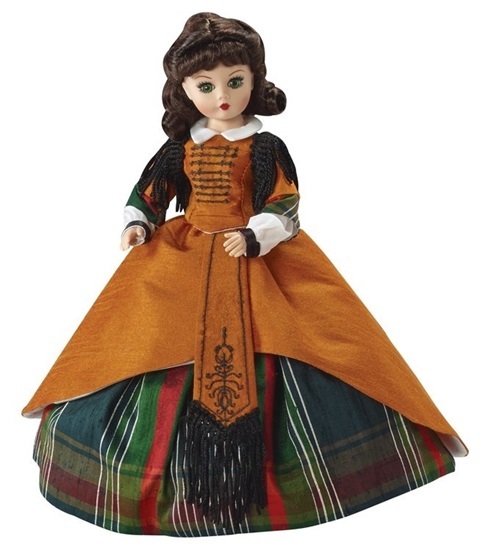 Madame Alexander introduced Scarlett at the Mill, from their Gone With The Wind series as a 10 inch Cissette doll. Based on Warner Brothers classic movie, Gone With The Wind. Scarlett O'Hara returns to the Madame Alexander line as a 10 inch Cissette doll. She is fully articulated for fun poseability and made of vinyl. Scarlett wears the iconic dress from one of the movie scenes filmed at the Mill. A 2015 Madame Alexander doll. Suitable for ages 14 and up. Her dress is a multi-colored plaid taffeta with a rust colored silk overskirt. A sash is attached to the front of the skirt with black fringe, and black fringe also accents her shoulders. Under her skirt is a taffeta half-slip and pantaloons. High-heeled black boots complete her ensemble.